A business and marketing edge all in one. 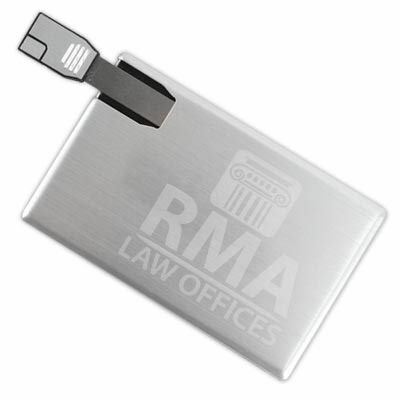 The Aluminum Credit Card promotional USB drive is a metal business card with a flash drive built in. Easy push out access to the connector helps easily load your data. Business card format provides an extensive print surface that is perfect for helping you increase brand recognition. For sleek data storage paired with excellent promotional power, the Aluminum Credit card is the way to go. 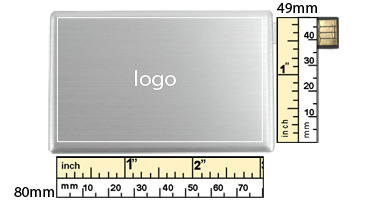 It has a large and attractive print space for your logo or brand name; this option is the modern marketing tool. It features silkscreen printing and data preloading services which are beneficial to pushing your businesses’ MO. It comes in a variety of data capacities to better serve your needs. It has a stow away connector that lets the design stay sleek and modern with great aesthetic potential clients will love.